Whether you're tackling a road marathon or you’ve just discovered your local 5K park run, the most important piece of kit you need is a decent pair of running shoes, right after a vest and a tiny pair of shorts. Finding running trainers that best suit your feet and gait can be the difference between heavily pounding the pavement, and feeling free and easy while you float over the miles. If spring is giving you motivation to start running, or you’re looking at the racing season and considering a new pair of running shoes to speed you to your goals, now is a great time to start hunting for the perfect footwear. New shoes have launched, and it's now 'sales season' – which makes it a great time to buy cheaper running shoes and trainers. Bear in mind, too, that last year's models are often worth a punt if you can find a deal – often the difference compared to the very latest running shoes is minimal. (That's also true if you're shopping for trail running shoes.) You'll find the lowest prices anywhere on all the best running shoes below, courtesy of our price comparison tool. Runners' needs vary so wildly, but despite more recent launches from all the big brands, if I had to choose one shoe that’ll deliver for most runners, it still the Nike Zoom Pegasus Turbo. It features incredible energy return thanks to Nike's practically magical ZoomX foam, and though it's a road shoe, it can be worn on other surfaces too. A challenge to the Adidas Boost foam’s dominance over the past few years, Nike has produced a running shoe that’s a winner for the everyday. If you’re looking for a good blend of protection and stability, I personally also love the Asics Gel-Kayano 25. They’re designed for endurance runners who like going the distance and they're ideal for long Sunday runs. Those wanting to go in completely the opposite direction might want to try the Nike Zoom Vaporfly 4%. Possibly the most advanced running shoe ever, this is designed specifically to help elite athletes crack the first sub-two-hour marathon… but who knows? It could also knock big seconds off your next park run. But you will have to hunt hard and be willing to pay a premium because Nike only makes them in small batches. Those seeking a cheaper (sub-£100) running shoe should look no further than the excellent New Balance Fresh Foam Beacon. It's a bargain. The right running shoes for you will depend on your running style and personal preferences, but we'll help you pick the perfect pair in this guide. Every model has been worn, tested and put through its paces – and each is labelled with what it's 'best for', from overall excellence to maximum support to the best minimalist shoe, to help you choose the best running shoes for you. The Nike Zoom Pegasus Turbo is a lightweight version of the brand’s popular Pegasus running shoe. Its headline feature is the ZoomX foam, which first featured in Nike’s revolutionary VaporFly 4% shoe and was used later in the VaporFly Elite. The tech originally emerged as part of Nike’s Breaking2 initiative, which targeted – and came within 25 seconds of – a sub two-hour marathon. Both of those models were really hard to come by for consumers, but now the tech is trickling down to more mainstream running shoes, designed to be worn every day. Nike says ZoomX builds upon the beloved Pegasus with added speed and responsiveness. The energy return rivals even the Adidas Boost tech (see number five in this list), but in a lighter shoe overall. It performs best on the road, where it excels, but is versatile enough to carry you further and faster on a number of surfaces, partly because the raised rubber sections on the bottom offer additional support and the protection offered by Nike’s Flywire cables. Some runners won’t like the shallow toe box. But when it comes to cushioning and responsiveness for longer runs and daily use alike, most runners will find the Nike Zoom Pegasus Turbo a top choice. The ASICS Kayano 25 running shoe is custom-built for endurance, so whether you’re heading into competition or a long training run, this training shoe will keep you feeling strong all the way to collapsing in a heap at the finish line. Protection and stability are the name of the game here. The company’s FlyteFoam Lyte tech promises shock absorption, while the medial support system and metaclutch cradle hold the heel in place. There’s a redesigned, two-layer Jacquard mesh upper, and a more spacious toe box to protect your feet on those gruelling endurance runs. As always, ASICS offers a number of attractive colour options to keep you on fleek and unique during the slog (the white/blue variant is particularly attractive). However, all of that support does come at a cost. At 325g it’s a little on the heavy side compared to some of the running shoes in our list. If you’re looking for a little more responsiveness and flexibility, you might want to try the ASICS Gel-Nimbus 20. The Beacon might look like a clunker, but looks can be deceiving, and this is actually one of the best all-rounder running shoes available. The Fresh Foam cushioning is so lightweight that the men's version of the Beacon comes in at just 213g, and the responsive ride it offers makes it as well-suited to racing and fast training sessions as it is long, easy efforts. New Balance opted against putting any rubber on the outsole of the Beacon, which has helped to keep its weight low, but might mean that the unprotected foam wears down more quickly than on other shoes. However, since the Beacon costs just £90 at a time when most running shoes brands are moving prices nearer £150 (or even above), you might well be able forgive a slightly shorter lifespan. The Nike Zoom Vaporfly 4% is a slightly tweaked version of the Nike Vaporfly Zoom Elite shoes that helped the world’s fastest runners come within 26 seconds of busting through the sub-2-hour marathon barrier for Nike’s Breaking2 Project. It’s as close to a complete reimagining of the running shoe as you’re going to get. Both Eliud Kipchoge and Mo Farah will be wearing them during the London Marathon next spring, with world record holder Eliud calling the system "perfect...really perfect." A study by researchers at the Department of Integrative Physiology at the University of Colorado, assisted by Nike Sport Research Lab, claims: "The prototype [Nike Vaporfly 4%] shoes lowered the energetic cost of running by 4 percent on average. We predict that with these shoes, top athletes could run substantially faster and achieve the first sub-2-hour marathon." Offering an elite-like shoe that mortals with a decent bank balance can use to smash their own personal records, the Vaporfly 4% System combines four outstanding, speed-enhancing features. The first is the new Nike ZoomX foam, the company’s most responsive EVA foam to date. It’s ultra-lightweight, soft and capable of providing up to 85-percent energy return, all of which makes this a very fast and surprisingly stable shoe to run in. Next, tucked away within that magic foam is a full-length curved carbon fibre plate that covers the entire sole. This increases stiffness, creates a sensation of propulsion and puts more acceleration into each push off. For added traction there’s a blown rubber super-thin outsole but this runs just under just the forefoot section rather than the whole shoe to save on weight. Finally the heel also features another thin layer of Zoom foam with added grip to soften impact. Put all of these together into a shoe that weighs just 195g and according to Nike you get an average of 4% improvement in running economy – that means you’re 4% more efficient as opposed to 4% faster – compared to their previous fastest racing flat. Sadly they are also a little more than 4% more expensive than most other running shoes. The Nike Zoom Vaporfly 4% is often not available because it's made in small batches. However, at present the Nike 4% Flyknit – which is also designed to help marathon runners improve their speed – is on sale. The most substantial revamp of the wildly popular UltraBOOST since its launch back in 2015, the UltraBOOST 19 features several updates designed to make it feel more comfortable and responsive on the foot. That starts with Adidas adding 20% more Boost into the midsole, which makes the shoe firmer and bouncier when running, with the torsion system built into the sole also adding some snap to the heel-to-toe transition of the shoe. It’s still a shoe focused on comfort over speed, however, and the Primeknit 360 upper is a full sock that sits on top of the midsole to completely wrap the foot. The snug mesh around the midsection prevents your foot from sliding around in the knitted upper and replaces the plastic cage on previous UltraBOOSTs, which could be uncomfortably tight – so much so that some runners took to cutting it off. Adidas don’t tend to change the Boston much with each annual update, and frankly why would they? This is an incredibly popular shoe and for good reason. The Boston 7 is a tremendous race-day option for pretty much any distance, with just enough Boost cushioning to keep the pep in your step over a marathon, but not so much that you’re carrying unnecessary weight when shooting for a PB in a 5K. 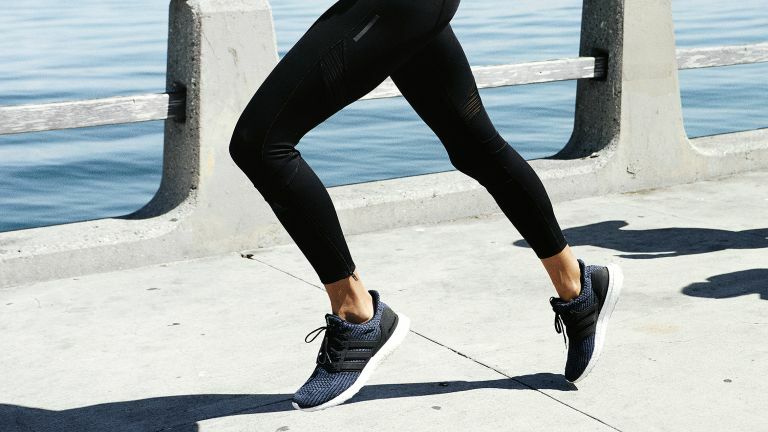 Make sure to size up, because Adidas shoes tend to run small – what it calls a snug racing fit, many of us might refer to as uncomfortably tight. However, once you have the right size there are few shoes that will serve you better in your next race, and during all the training leading up to that race as well. Saucony’s Triumph ISO line has always managed to provide a supremely comfortable ride without completely sacrificing speed, and the fifth edition of the shoe is the best yet in this regard. That’s mostly down the Everun midsole and topsole in the shoe. Everun is Saucony’s proprietary foam and it provides a similarly springy ride as Adidas’s Boost. As a result of the double layer of the foam in the Triumph ISO 5, you’ll be consistently surprised at how fast you’re going on your easy and steady runs, because it will feel easier than ever before. The weight of the shoe does count against it when you really try and push the pace, so it’s not one you’ll see down the track or on the start line of a 5K very often, but the Triumph ISO will certainly serve you well for long races and training runs. On’s running shoes are generally geared more towards fast running, with the distinctive pods on the sole offering a great cushioning-to-weight ratio that makes them especially good for long races in particular. However, with the Cloudsurfer the focus is more on providing plenty of support for your daily training. The shoe has an extra layer of EVA cushioning on the heel of the shoe to ensure a soft landing, and the ride is far less firm than on other On shoes in general, making the Cloudsurfer a great for easy efforts in particular. The Cloudsurfer is certainly a shoe made for the road, and lacks traction if you do step off the tarmac, which is inadvisable at any rate due to the pods’ mildly annoying habit of picking up small pebbles. Comfort comes first, second and third with this cushioned shoe from Brooks, and while it won’t win many plaudits from those seeking maximum speed from their footwear, it’s so nice to pull on that you might just forget about PB hunting for a while. The plush collar on the shoe sets the tone for what’s to come when you slip your foot in, as it wraps the ankle in what feels like a duvet’s worth of padding. The midsole contains Brooks’s DNA Loft cushioning, which provides an ultra-soft feel to every step, and the breathable upper stretches to wrap around the foot. Heavier runners in particular will appreciate the level of support offered by the Glycerin, and it would also make for a good marathon shoe for runners who’ve found lightweight options like the Boston Boost uncomfortable over long distances. Save this one for easy running days and it won't let you down. Becoming an elite runner is as much about the reps you crank out in the gym as the miles you rack up on the track. The On Cloud X is designed to push you through a strength workout, but is a great standalone good running shoe in its own right. Billed as the lightest fully-cushioned running shoe in the world (229g for size 8.5), it is much firmer under foot than your average cross trainer, so you may not want to rely on it every day. However, it has the latest CloudTech midsole, accompanied by Zero-Gravity foam, to provide support for those quick changes of direction. The heel is engineered for comfort and support, while the upper is engineered from a highly breathable lightweight mesh. As always with On running shoes, the design and construction is flawless. This was the first shoe to feature Nike’s new midsole technology, React foam. This Adidas-Boost-bothering foam features a synthetic rubber compound that’s created by Nike’s clever chemical engineers to be light, responsive, durable and cushioned. What this means in practice is 20 per cent more mileage (that’s 600 miles instead of 500 if you were wondering) before your shoes need replacing, 13 per cent more energy return than any other Nike shoe and a midsole foam that’s 30 per cent lighter than Boost foam. And this is a light shoe. The Nike Epic React Flyknit comes in at 239g, that’s 5 per cent lighter than its predecessor, the Lunar Epic 2. It’s not just about the new rubber formula either, Nike also used computational design to crunch thousands of runner data points and to whittle away foam where it’s not needed and produce a shoe that copes with pressure in the right places without any foamy excess baggage. The uppers are fashioned from the familiar Flyknit we’ve come to know and love and that means a snug, comfortable fit that feels secure around the instep, but leaving plenty of wiggle room and flex around the toes. There’s also a heel cup for added stability. The Nike Epic React Flyknit is most at home on the road and will cope with everything from a fast 5km to those longer marathon training runs. Last year we had the Brooks Ghost 9 in this list, but it has been usurped by the Brooks Levitate 2. As the name would suggest, this shoe is all about the energy return. Brooks’ most responsive midsole is equipped with the DNA AMP tech that promises to ‘control, capture and return’ your energy, to ensure you’re bounding along the track or trails. The company is also adding new Achilles Guard tech to protect that all-important tendon, while the arrow-point pattern on the crystal rubber outsole gives you rapid movement from the heel to the toe. There’s an internal bootie that promises comfort and support, while the FitKnit upper wraps around the heel to guard against irritation. Yes. A decent pair of running-specific trainers will cushion your feet and legs from the impact of repeatedly hitting the pavement. They’ll also be flexible in all the right places and they’ll help protect against common injuries. But choosing the right shoe isn’t as easy as just picking the one you like the look of. The difficulty in recommending running shoes is that while some are better than others, the 'best' shoe for you also has to suit how you run. We all run different mileage, land differently, weigh different amounts, and have different shaped feet, and our shoes should reflect that. If you’re a heavier runner you may find a supportive, cushioned shoe will help absorb some of the impact as you run, while lighter runners might prefer a more minimal shoe. Likewise, for longer runs you may want bounce and cushioning for a comfortable ride, while on race day or shorter runs you opt for something lighter, faster and more minimal. Gait can also be a big factor. If your gait shows an excess of pronation or supination (inward and outward rolling of the foot as it strikes and pushes off from the ground), as you may need a shoe or insole that addresses this. While all these variables may sound complicated, particularly if you’re new to the sport, keep the following five golden rules in mind before buying new running shoes. Drop into a shop like Sweatshop, Runner's Need or Vivobarefoot's stores and you can get a full gait analysis test done. This often means running on a treadmill or along the street so staff can help you identify the type of running shoes and support that's best for your running style. Most of the staff will be runners themselves, so you’ll also get some handy hints on how to improve your technique. You may be able to find bargains online but it’s always best to try shoes on before you commit. Sizes can vary significantly from brand to brand, and it’s often worth going a half or full size up to allow for feet swelling as they become hot. Even a brisk walk around the store, or in a carpeted area if you’re trying on at home, can give you a good idea of comfort and help highlight any niggling spots – that slightly slipping heel may feel minor now but think what it’s going to feel like after an hour or so on the run. Where you plan to run is important: road, trail, or a mixture of both. In general, trail running requires more support and road requires more impact protection, but again this can also be affected by how you run, and what you find comfortable. In a lot of cases you might want to choose a training shoe for longer mileage and a race shoe that's lighter but better used for shorter periods of time, like a four-hour race. Either way, it's important that you've worn your shoes in before you hit race day, or put in the longer runs. When it comes to the crunch, knowing you’ve found the right shoes for you comes down to how you feel when you put them on. A good sign that you’re making the right choice is a pair of shoes that almost melt into the background from the moment you slip them on, to the point that you don’t really notice you’re wearing them.